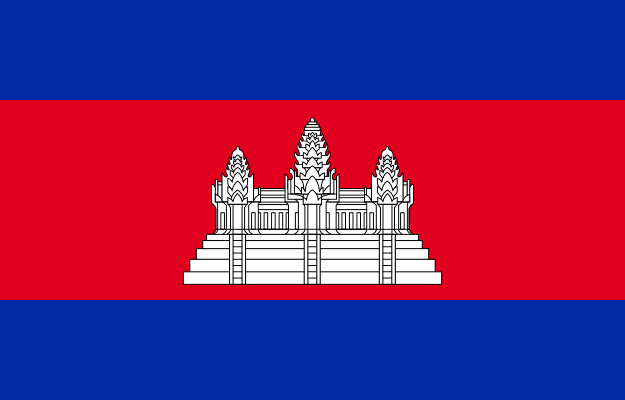 Siem Reap is a small town located in the north-east of Cambodia. 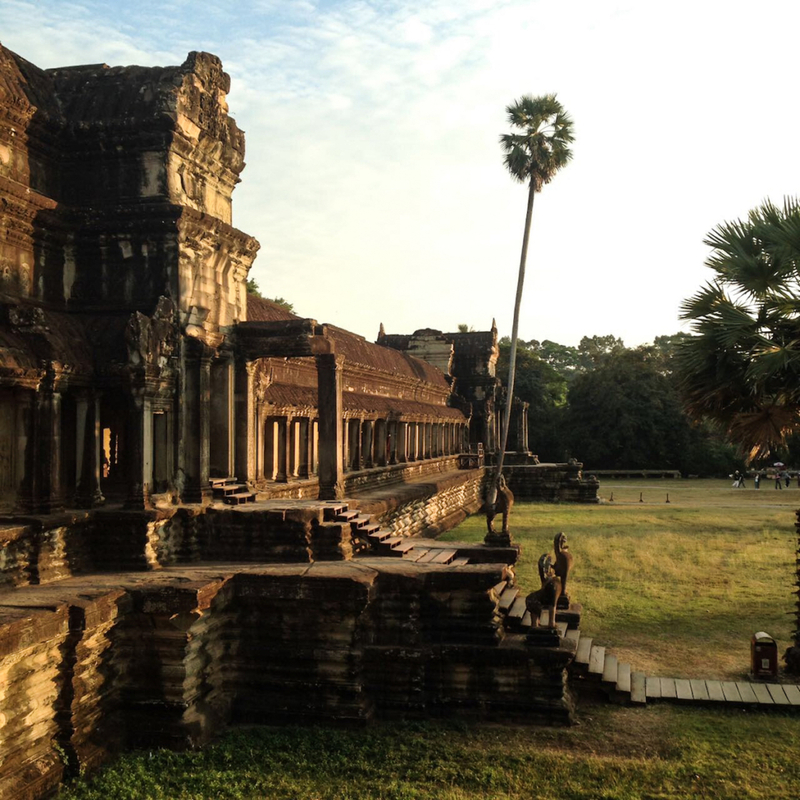 The town is well-known as the place people stay while visiting the Angkor Wat Temple Complex, the largest religious monument in the world. 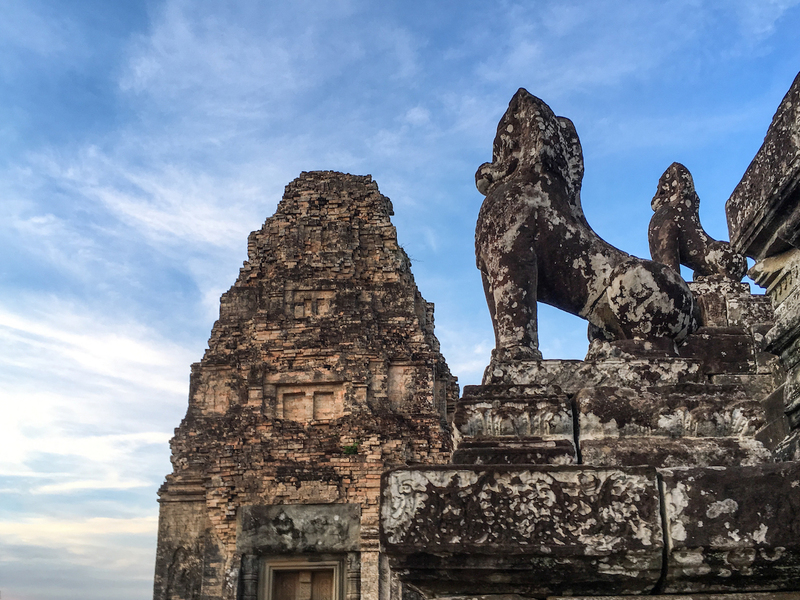 Increasing numbers of tourists travel to discover the ancient ruins hidden among the jungle of this huge valley, it has become a symbol of Cambodia as the country’s prime attraction for visitors, even appearing on its national flag. 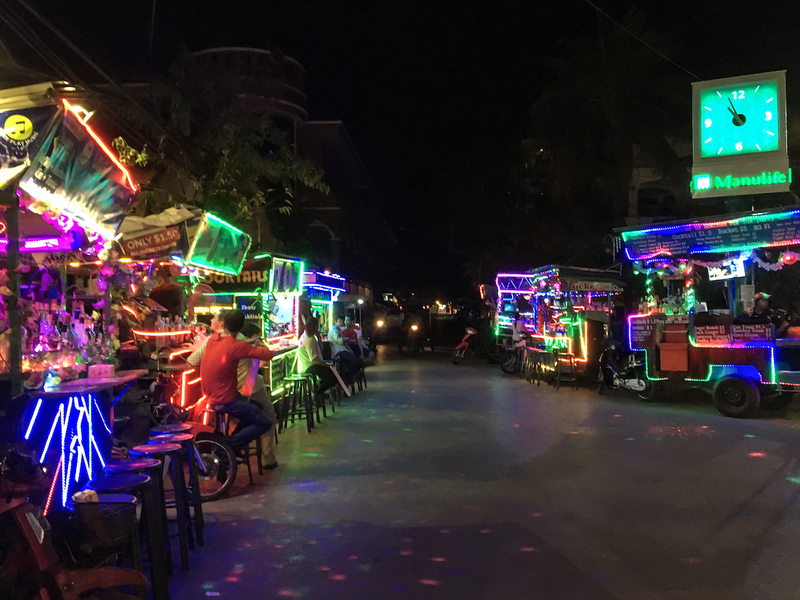 Visitors usually need longer than a day to visit the temple complex and after staying during the day at Angkor Wat, they spend the evening among the streets of Siem Reap. 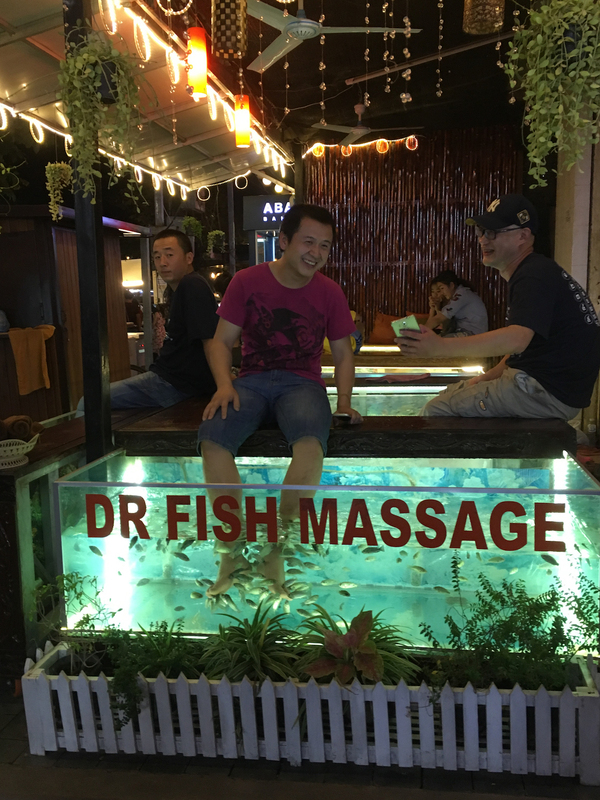 Pub Street is well known for its pubs and restaurants, the night market offers various souvenirs made by local artisans and there are plenty of spas offering fish pedicures… why not try an insect dinner too?! A couple of years ago, Davy Blouzard from France opened an insect restaurant called the Bugs Cafe. The café is becoming a big attraction in the small town. 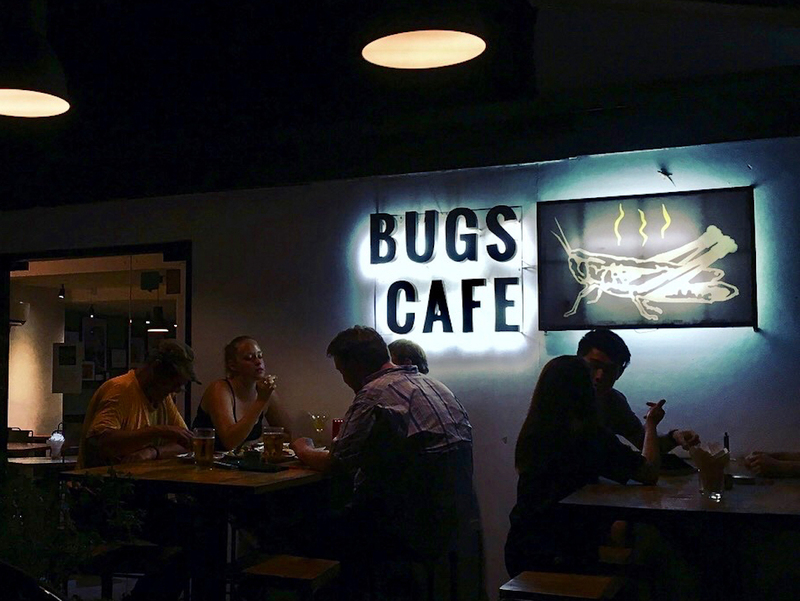 More and more people are challenging themselves to eat insects and the Bugs Cafe offers a delicious menu. 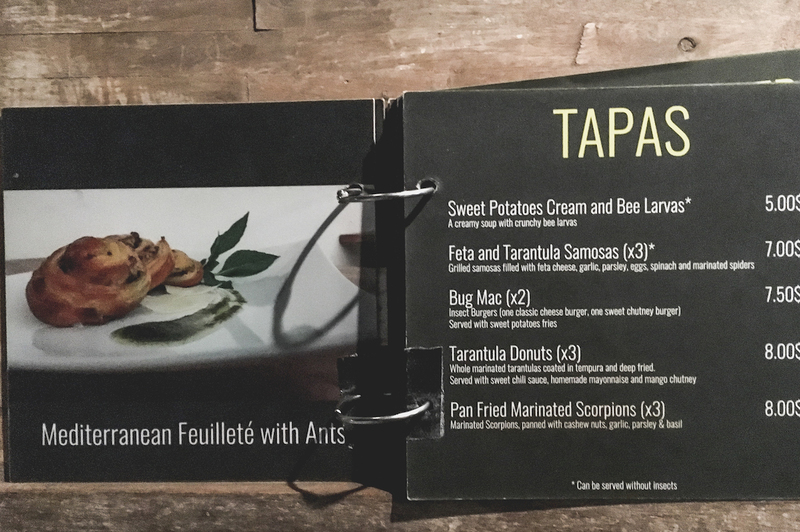 The cocktails are fresh and exotic and people can choose to combine their drinks with small insect tapas, an insect burger, insect wok dishes, and amazing desserts. For those who aren’t into insects, there are other sorts of protein on the menu. Crocodile, for example, or even snake! Chef Seiha Soeun has years of experience in cooking intercontinental dishes for hotel restaurants and is very familiar with different cooking techniques and international tastes. 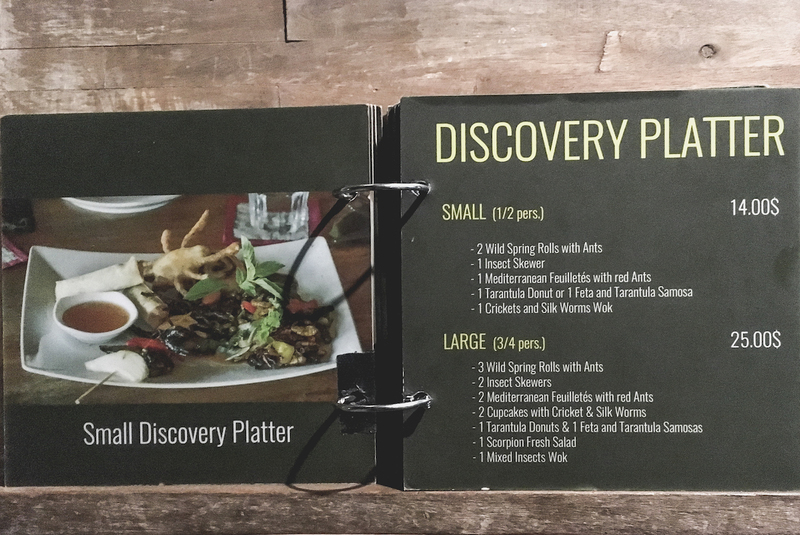 He combines local ingredients with recipes from all over the world. 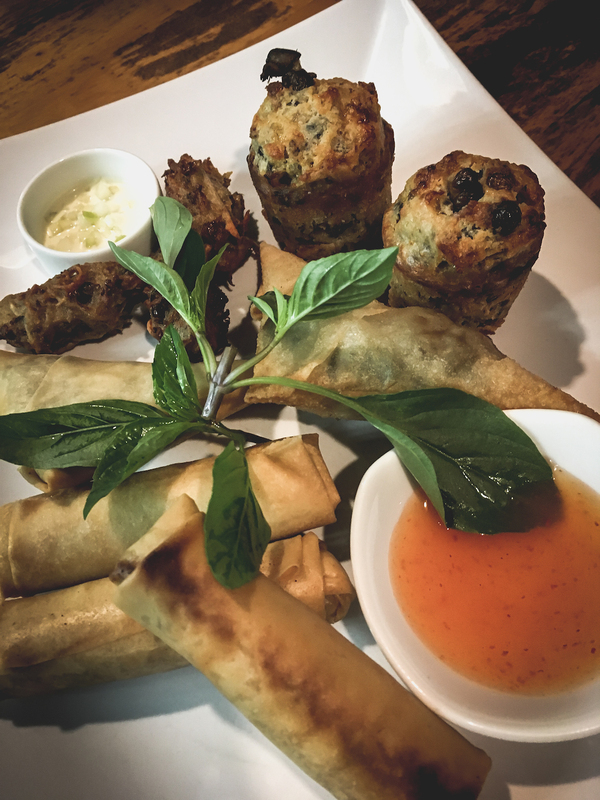 We started with an Insect Discovery platter: two wild spring rolls with ants, a scorpion insect skewer, a cricket and silk worm wok, Mediterranean feuilletés with red ants, one tarantula donut and a feta and tarantula samosa. 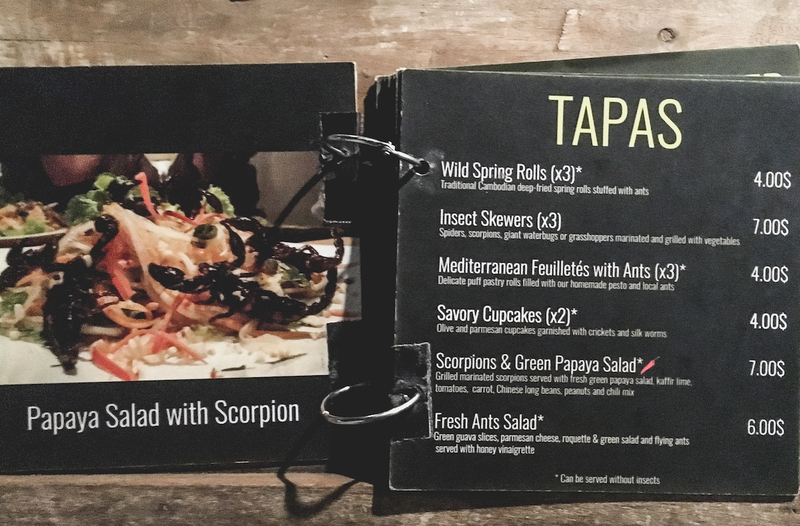 Everything was very tasty: the tarantula and the scorpion were crunchy and succulent. 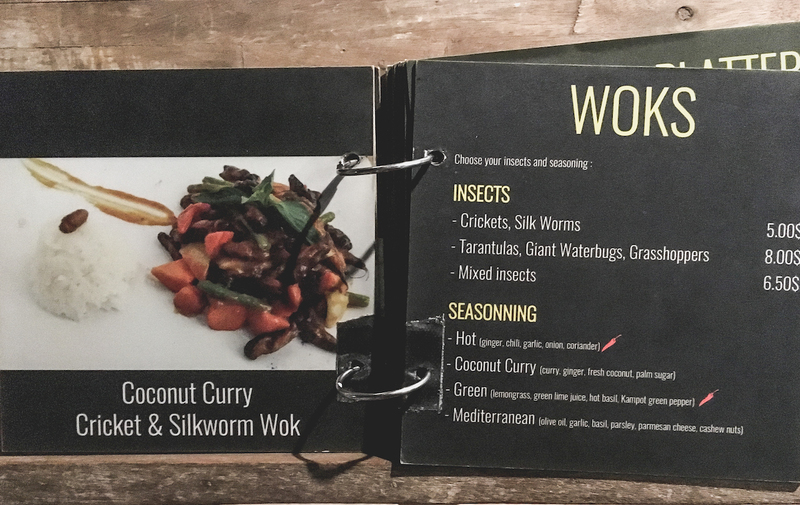 I was surprised to find out that you can eat the insects whole when they are fresh and cooked correctly. 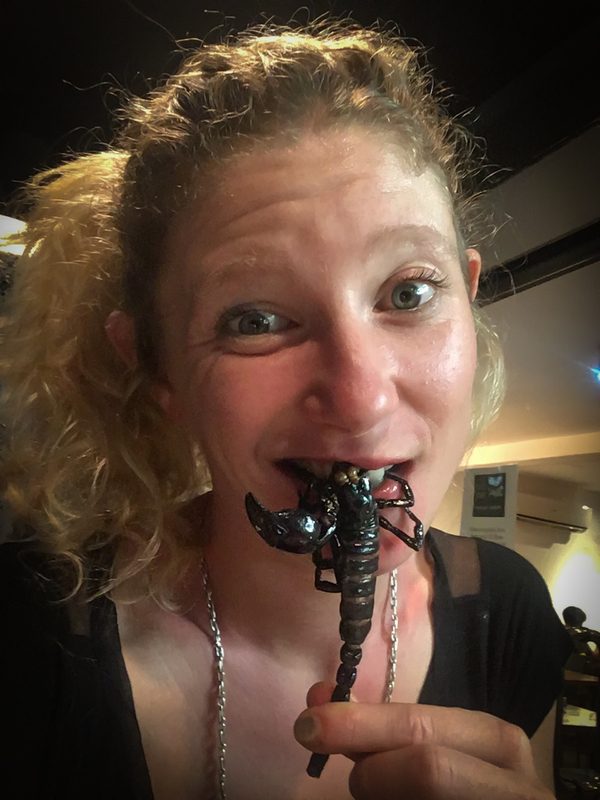 Nothing is left over from a scorpion and the same goes for tarantulas and spiders: you eat the whole body… and it’s delicious! The whole meal reminded me of eating shellfish. 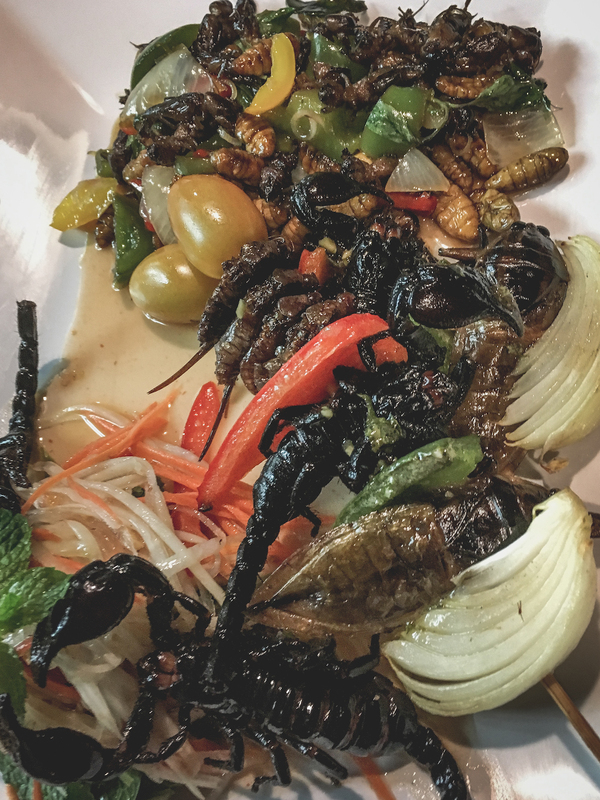 We were so amazed by this dinner that we returned every evening to eat more yummy bugs, gradually trying everything on the menu. And everything was worth trying. My personal recommendation is the cricket cheesecake with passion fruit coulis: a sweet treat for your senses!